Standing on a hill looking down at the tsunami-devastated town of Ishinomaki, Japan. 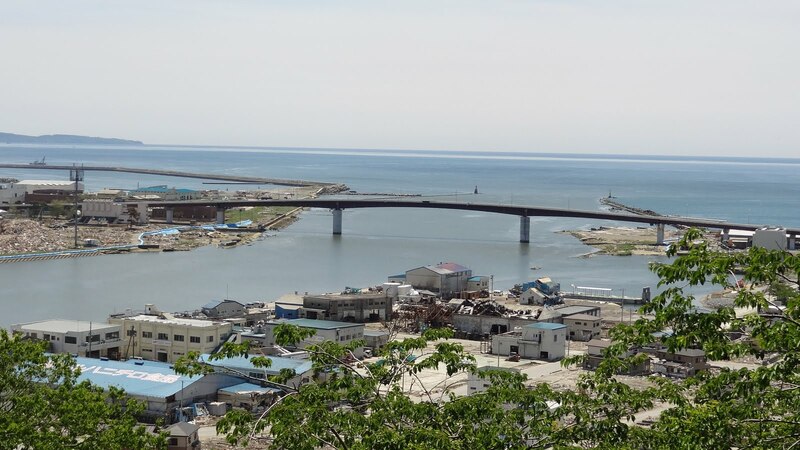 However, the recently retrofitted Hiyori Bridge is undamaged. It's a haunched steel box girder bridge across the mouth of the Kitakami River. We'll take a closer look at it tomorrow. Japan's Bridges: Hiyori Bridge across the Kitakami River in Ishinomaki (1) by Mark Yashinsky is licensed under a Creative Commons Attribution-NonCommercial-NoDerivs 3.0 Unported License.